Why wasn't Elihu included in God's scolding to Job's friends? Time and time again throughout the story of Job, Job's three friends, Eliphaz, Bildad, and Zophar, make speeches to Job. Then, seemingly out of nowhere, a fourth friend steps in and is given six consecutive chapters to present yet another speech to Job. However, at the end of the story, God chastises all of Job's friends except Elihu. Why was he exempt? Was there something special about his speech that God liked? Ray C. Stedman believes that there are four reasons that Elihu is an integral part in the book of Job. (1) When you come to the end of the book and you read the rebuke that God gives to the three friends of Job, you will note that Elihu is not included. (2) He is given an obvious, prominent part in this drama. His message occupies several chapters, and he is allowed to give one of the major discourses of this book. (3) He always speaks with courtesy and sensitiveness to Job, despite the strong feelings which he admits he has. He recognizes the depth of Job's suffering, and he always speaks with understanding. (4) Elihu claims to speak not as the other men did from their experience, but he claims to speak from revelation. Stedman also says that he believes "that Elihu [ultimately] comes into the book as the answer to Job's cry for an explanation." For the purposes of answering my question, probably the most relevant point is 4 along with his statement as to why Elihu was sent. Wikipedia notes and agrees with these points and adds this: "The speeches of Elihu contradict the fundamental opinions expressed by the 'friendly accusers' in the central body of the text, that it is impossible that the righteous should suffer, all pain being a punishment for some sin. Elihu states that suffering may be decreed for the righteous as a protection against greater sin, for moral betterment and warning, and to elicit greater trust and dependence on a merciful, compassionate God in the midst of adversity." So now we can see that there is, in fact, at least one difference in Elihu's speech. He points out a positive reason why Job is suffering instead of blatantly accusing him of some hidden sin. But what about Stedman's option number 4 in which Elihu claims to speak from revelation? He does indeed claim this in Job 36:2 - Bear with me a little, and I will show you, for I have yet something to say on God's behalf. So was God not angry with Elihu because Elihu was carrying a message from Yahweh himself? It's possible. It is possible that with an admonition for Job to stand still and consider the wondrous works of God, Elihu seems to be preparing Job for what is about to follow, namely, the whirlwind. Previously, Job and his friends had been arguing back and forth, and their debates had been thoroughly exhausted until Elihu appeared and proposed a new cause for Job's suffering. 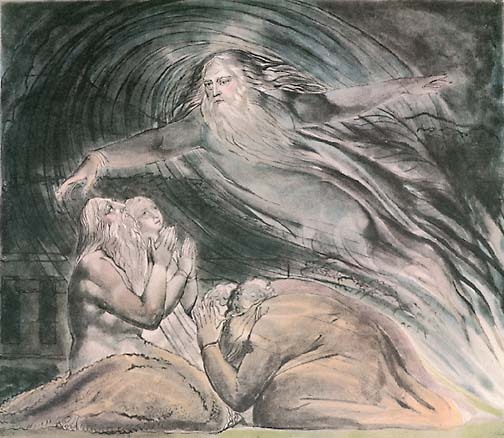 Elihu aroused new thoughts in Job, and his warning to him to regard God's works likely set him up for Yahweh's speech from the whirlwind in which he asked Job rhetorical questions regarding his creation. I find it odd that my research on this subject differs greatly from the commentary in our ESV Literary Study Bibles. After reading the notes in the boxes before each chapter, I thought that Elihu was some kind of young, arrogant punk who was long-winded and hadn't accomplished anything more than the other three friends had managed to accomplish in their speeches. The editors even accuse Elihu of "conceitedly" speaking on God's behalf (page 733 in our Bibles). However, on that same page, they do agree with the fact that Elihu prepares Job, as well as readers, for God's whirlwind speech that follows. Whether you agree with the opinions of those whom I researched, or you agree with the thoughts of the ESV Bible, they both seem to agree on at least one point, that Elihu prepared Job for the whirlwind speech. So why didn't God include him in the chastisement? I like the idea that Yahweh sent Elihu to answer Job's cry for an explanation of his suffering and that God sent that message through Elihu. God was angered with Eliphaz, Bildad, and Zophar because of their false accusations against Job; but Elihu relayed Yahweh's message to Job and prepared Job for God's speech. I have personally come to the conclusion that, basically, Elihu was used by Yahweh, and that's why he didn't include Elihu in his scolding. I love the book of Job because God speaks and I get to read what Yahew says. I ask Yahew to teach me as I read about him. After reading the last commentary from Job's friends, I notice I cried when his friend Elihu spoke, I could not understand at first why, until God reveal it to me, it was Yahew speaking through Elihu. I went to google searching for someone else who knew this and I came to this website and was more enlighten. Thank you for your open ears and eyes to know the truth of God's words. I have never heard anyone preach or teach on this subject. I hope I will one day. I suggest you re-read the Book of Job in it's entirety and pay close attention to the "punctuation". You will get a much firmer grasp of what took place. I loved reading the Word of God about Job and his friends, how the fourth friend wasn't revealed until the end after hearing the advice and argument between Job and his friends and how he was silent through all of it and when they had finished there thoughts he spoke on behalf of God, young but with wisdom and insight from God it is amazing how we count people out because of one reason or another. In response to “tom”. There was no punctuation originally. It was added by the translators. So we really have no way of proving anything by punctuation. Just yesterday, I re-read the passage featuring Elihu's speech to Job. I believe that Elihu served as a messenger, almost like an earthly angel--God's messenger. I also think that Elihu's speech was a message which was to prepare Job for his encounter with God/Yahweh. God allowed Job's affliction, but it was Satan who administered it. I suspect that God's major problem with Job's three friends is that they attributed Satan's evil works to God: they said that God had CAUSED Job's pain when actually it was Satan causing Job's pain. I wonder if other readers might agree with that? To understand whether Elihu was a messenger of God or not we must keep in mind why Job was suffering. It was not because he had sinned. The Lord rebukes Job for his present attitude of mind and heart, but that does not change why all this calamity had happened. No one understood why Job was suffering. The Lord pointed out his righteousness to Satan, and he asked permission to afflict him. Job's afflictions caused him to doubt Gods justice. Elihu used the same arguments as Job's 3 friends and had other interesting things to say. But, in the end, Elihu was no different than jobs other friends when it came to bringing any light to the situation. The reason Elihu was not chastised along with Job's other 3 friends is because he didn't tell Job that his trials were caused by sin. Instead, he told Job that his reactionary words were both sinful and rebellious. The Spirit of God did speak through him as he paved the way for the Father himself to speak. Several people have a piece of the puzzle but I suggest you put them all together. Notice job doesn't speak to God when his family dies. Nor does he speak to God when his flesh is affected. The only time he speaks to God directly, is with mocking questions, doubt and spite. HE and his friends kept at it, flaunting how wise they were. They were closed minded to learning any more about God. Elihu's speech was perfect. He tells them all that God is an endless wonder, and to assume you know "enough" is naive. He tells them how it's no small thing that the sun shines or water freezes, wind blows or rain falls. The world that God made is mind blowing, so how much more is God? This was elihu's point. They had put God in a box. They expected that if they do good, they would get rewards. But God also wants a relationship with us as well as admitting that God can not be "boxed". Which is what happens after God reveals a million questions mocking job at how little he knows about God and all he's done. Job finally admits it. He admits that he can't fathom God after all. And he tells God that he will speak to him from then on. "I will ask you questions, and you will answer them". Good deeds alone don't save you. You need a relationship with God. That's what this was all about. Katie Cleveland’s main twofold thought isn’t new. Unless I’m missing something (which wouldn’t be the first time) it sounds to me identical to the view “usually” held by critics and published before 1911. The following was published in Bibliotheca Sacra 156 (January-March 1999): 28-41 Copyright 1999 by Dallas Theological Seminary. It's title was “The authenticity of the Elihu Speeches in Job 32-37, by Larry J. Waters. Katie Cleveland admits to having “researched” in 2 older sources, referring to her “research” twice: “I find it odd that my research on this subject differs greatly from the commentary in our ESV Literary Study Bibles.” And, “Whether you agree with the opinions of those whom I researched, or you agree with the thoughts of the ESV Bible, ... .” And she cites Ray C. Stedman. She says “Stedman also says that he believes ‘that Elihu [ultimately] comes into the book as the answer to Job's cry for an EXPLANATION’" (as to WHY Job is SUFFERING). Strange that Cleveland also suggests that those she “researched” (i.e. Stedman and ESV notes) LACKED that, and said they ONLY got the “preparing Job for the whirlwind speech” notion: She said, “Whether you agree with the opinions of those whom I researched, or you agree with the thoughts of the ESV Bible, they both seem to agree on at least ONE point, that Elihu prepared Job for the whirlwind speech.” So it sounds almost like she’s “out done” Stedman and the ESV notes by “hitting upon” the notion of explaining the SUFFERING: Says she, “I like the idea that Yahweh sent Elihu to answer Job's cry for an EXPLANATION of his SUFFERING.” Maybe Katie Cleveland absorbed it from Stedman without realizing it. She might have picked up on these two (2) factors while “researching” the sources she consulted (though only ESV notes and Stedman are mentioned) and not even realized that it was they that made the light come on. I have had that happen to me, I’m embarrassed to say: I have read a particular book four times (yes, I read and re-read some books) and later, “come up with” a notion that’s never occurred to me before, and have shared it with others as though it “just came to me out of no where.” Then, the next time I happen to open that old book I’ve read before, I am embarrassed to find that the book said that exact thing! So I then realize that it had gotten into me without me being aware of it. It has happened “live” with people as well. I have actually “taught” a person some insight of mine, only to have them inform me, “I taught YOU that, four years ago!” And upon thinking back over the period, yes, Oh my gosh! It’s true, they DID, and hadn’t taken any notice of it. I know this phenomenon of thinking a thought is “original” with me, only to learn, no, I was previously exposed to it. So, maybe this is happening with Katie Cleveland: The “tone” of her writing “sounds like” a person sharing their own original insight after finding her research sources somewhat lacking. But the fact is, that “insight” was in those sources. And not only so, but as I pointed out from Larry J. Waters quoting Nichols in 1911, those two particular “insights” or “notions” were in fact the “usual” view of critics, published generations before, say, Stedman. In other words, nothing new there. Daniel, After reading your comment I re read what the author wrote and realized that you should probably also rectead what she wrote. She very clearly lays out Stedmans 4 points (point 4 being the one she quoted that she ‘likes’ later on, which you thought she came up with that on her own (but then offered up the reasoning that she absorbed it without realizing it), when in actuality a careful reading of what she wrote shows she fully credited Stedman with the idea that she liked. She is not incorrect here-the vast majority of commentaries pretty much denigrate Elihu though most agree he prepares Job for the encounter with God. I never saw Elihu the way most of the commentaries I read did and like many others I also wondered why God didnt chastise Elihu like the other 3. I think you have misread the blog post somehow, that’s all. I would suggest that Elihu is the Lord Jesus. His discourse suggest that Job is a sinner not that he has sinned and caused his own folly. He does come to repent which is why God sent Jesus so we could be brought to God. God sent Elihu so Job could be brought to God. I believe that the events of Job's suffering came on two levels. The apparent one from the beginning was that God allowed Satan to afflict Job in order to display Job's righteousness even in the face of trials. The second, more hidden purpose, was, as Elihu said, to purify Job, even though still counted a righteous man, further from things such as pride (36:6-15). We see this pattern in the life of Paul as well, with Paul's thorn in the flesh (2 Cor 12:7). On one level, it was a "messenger of Satan," sent to torment Paul, but on the other level, God had allowed it to purify Paul further and protect him from the sin of pride and arrogance because of the all-surpassing visions of heaven he had seen.